The Electricity Generating Authority of Thailand (EGAT) has signed a Memorandum of Understanding (MoU) with 4 financial institutions to cooperate on a promotional campaign for domestic refrigerators that use climate-friendly natural refrigerants within the scope of the Thailand Refrigeration and Air Conditioning Nationally Appropriate Mitigation Actions (RAC NAMA) project. This campaign is expected to help reduce energy consumption by 47 million units per year or 188 million baht and also lower greenhouse gas (GHG) emissions by approximately 25,000 tons per year. On February 20, 2018, Mr. Seubphong Buranasirin, EGAT’s Deputy Governor—Corporate Social Affairs chaired the MoU signing ceremony between EGAT and the 4 financial institutions who have joined forces on a new promotional campaign for fridges that use climate-friendly natural refrigerants. Implementing partners in the RAC NAMA project joined the ceremony at Kasem Chatikavanij Convention Hall, T.040 Building, EGAT Headquarters, among them the Deutsche Gesellschaft für Internationale Zusammenarbeit (GIZ), the Office of Natural Resources and Environmental Policy and Planning (ONEP) and the Department of Alternative Energy Development and Efficiency (DEDE), as well as producers and retailers of label no.5 fridges. Mr. Seubphong Buranasirin, EGAT’s Deputy Governor—Corporate Social Affairs noted that Thailand has set a GHG mitigation target of 20% by 2030, which was pledged at the 21st Conference of the Parties to the UN Convention on Climate Change or COP 21 in Paris. To achieve this ambitious target for GHG reduction and to reach the target for energy consumption reduction according to the country’s Energy Efficiency Plan, GIZ in partnership with the Thai government namely ONEP, DEDE, and EGAT, are jointly implementing the RAC NAMA project to support climate-friendly and highly energy-efficient cooling technologies in Thailand. It particularly promotes the use of natural refrigerants with ultra-low Global Warming Potential (GWP) such as R600a. Under the project, the “RAC NAMA Fund” was established with EGAT as National Fund Recipient (NFR) and the Project Fund Manager (PFM) to implement the financial support mechanism within the scope of the project for the four main products: domestic refrigerators, commercial refrigerators, air-conditioners, and chillers. 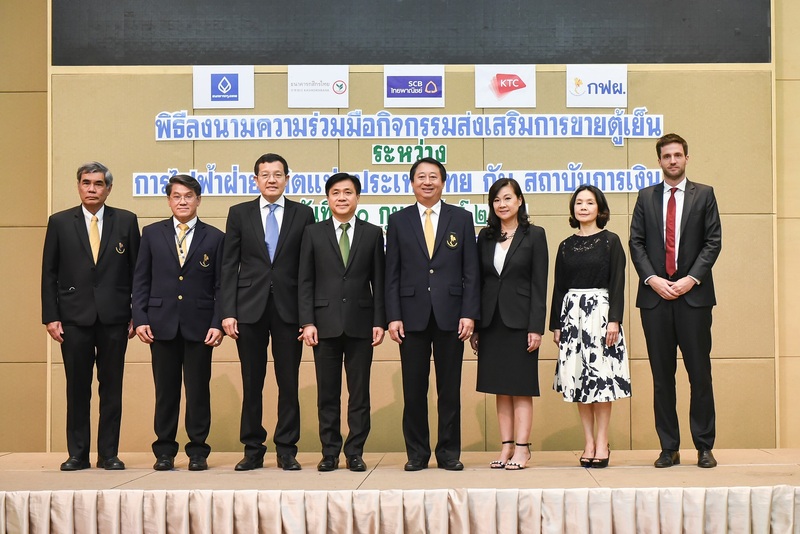 “Accordingly, EGAT has entered into partnerships with financial institutions to promote the sales of domestic fridges that use natural refrigerants such as R600a, which are significantly more climate friendly and energy efficient compared to other synthetic refrigerants. EGAT is working with four financial institutions, namely Bangkok Bank (BBL), Kasikorn Bank (KBank), Siam Commercial Bank of Thailand (SCB), and Krungthai Card Public Company Limited (KTC) to provide installment payment plans with 0% interest for 10 months for selected fridges that have the energy efficiency label No. 5 and use refrigerant R600a. With a total of 11 selected trademarks and 339 models of fridges, the promotional campaign through the 4 aforementioned credit card companies is expected to result in a total sales figure of 300,000 fridges and help to reduce energy consumption by 47 million units per year or 188 million baht and also reduce GHG emissions at approximately 25,000 tons per year. Consumers will be able to receive more information from big and small dealers, retailers, and shops throughout the country. Participating shops will have “Green Refrigerant” stickers, which indicate their participation in this campaign. The campaign will roll out from March to May 2018 and potentially extend to other types of cooling products in the future,” Mr. Seubphong added. Mr. Tim Mahler, GIZ Director Thailand, said that the RAC NAMA project is the first climate finance project in Thailand funded by the NAMA Facility, a joint initiative by the Federal Republic of Germany and the United Kingdom, to a total value of EUR 14.7 Million (approximately THB 565 million). The objective is to support developing countries in implementing ambitious country-led Nationally Appropriate Mitigation Actions (NAMAs) and to deliver concrete GHG reduction. Funding in the amount of EUR 8.3 million (approximately THB 320 million) out of the total budget has been specifically reserved to set up the “RAC NAMA Fund” with EGAT as the recipient on behalf of Thailand to implement financial support mechanisms in both sub-grants and revolving schemes to support the production and use of climate-friendly and energy-efficient cooling technologies in Thailand. Ms. Pakachat Taychaburapanone, SCB Executive Vice President and Head of First Division and Prime Division said: “SCB has long been committed to align our business with corporate social responsibility and one of our most important projects is ‘Better Quality of Life and Environment’. SCB is therefore very proud to be a part of this cooperation with EGAT and 3 other financial institutions. We fully support the campaign for fridges that use climate-friendly natural refrigerant by offering an installment plan through SCB credit cards at 0% interest for 10 months along with other marketing activities that the bank continues to offer to our customers.